We are supposed to love the Catholic Church. After all, Christ is in love with her. She is his bride. St. Paul desired to present the Church to him as a pure bride (2 Cor. 11: 2) and St. John in mystical vision saw her, glorious and radiant, adorned as a bride ready to be wed (Rev. 21: 2). It’s a bit harder for us. For most of us the parish is the Church. And the people in the parish. Adornment and glory, purity and radiance – well it isn’t just jumping out at us most of the time. We get that the Holy Spirit is the Soul of the Church and if we are faithful Catholics, we stake a great deal (everything!) on trust that the Holy Spirit is guiding what we name at every Mass as “God’s holy Church.” But most of the time this is just as obscure as the spiritual reality that our friends are animated by souls; we just don’t see souls when we look at people. And when we look beyond our local situation to the people of the wider Church or look into history the Church’s holiness often becomes more, not less, obscure to us. The centuries of the Church’s history are so filled with all sorts of human failure that we can quite understand Dante’s ghastly vision of the Babylonian whore sitting in the Church’s chariot; and the dreadful words of William of Auvergne, Bishop of Paris in the 13th century seem perfectly comprehensible.… “We are no longer dealing with the bride but with a monster of terrible deformity and ferocity.”… There is no theory in existence that could compellingly refute such ideas by mere reason, just as, conversely, these ideas themselves do not proceed from mere reason but from bitterness of a heart that may perhaps have been disappointed in its high hopes and now, in the pain of wronged love, can see only the destruction of its hopes. How then are we to reply? Ultimately one can only acknowledge why one can still love this Church and faith, why one still dares to recognize in the distorted features the countenance of the holy Church.… The holiness of the Church consists in that power of sanctification which God exerts in her in spite of human sinfulness… The thrilling interplay of God’s loyalty and man’s disloyalty that characterizes the structure of the Church is the dramatic form of grace, so to speak, through which the reality of grace as the pardoning of those who are in themselves unworthy continually becomes visibly present in history.… Those who really believe… live on what the Church always is; and if one wants to know what the Church really is one must go to them (339 – 344). One must go to them. One must go to those who really believe. One must go to those who live on what the Church always is and who believe what the Church has always believed. One must, then, go to the saints, and hope to be in their number. For it is in their struggles for the faith that you see revealed the Soul of the Church in its invisible glory. 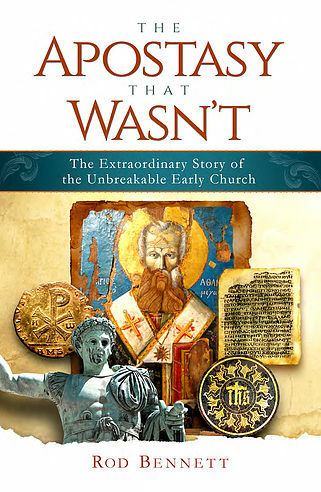 Which brings me to this new, exquisite, and marvelous book: The Apostasy That Wasn’t: The Extraordinary Story of the Unbreakable Early Church. Told by the masterful Rod Bennett, The Apostasy That Wasn’t gives the lie to the “history” that many Evangelicals think they know about the early Church: that pristine house-meeting, Bible reading, non- hierarchical, New Testament Church that fell into apostasy with the connivance of Emperor Constantine and morphed into that chimera of paganism with a Christian veneer that came to be called Roman Catholicism. The true story is more interesting and even more dramatic. In the pages of The Apostasy That Wasn’t we meet the saints who kept the faith and whose faces even until now shine with the Spirit’s glory: St Antony, St Athanasius, St Basil, and St Gregory. True, they shared the field of this world with those Catholic tares we also know only too well, involved with intrigues and scandals and as busy grasping at political power and worldly prestige as any we might meet today, but the story does not belong to the weeds who are destined for the fire (Mt 13:30). The story belongs to the wheat — that is, to those guided by the Holy Spirit into all truth. It belongs to these saints. Reading this book, you get to know them and the world they lived in and largely shaped – which to no small extent is our world today. Go to them. Fall in love once again with the Church. See her soul revealed — the Spirit of Charity, the Spirit of Truth – who even at this moment is guiding her. Click this link for more titles on Amazon by Rod Bennett . Click here for more CL book reviews of Bennett’s books and for an interview with Rod Bennett on CL. This title will hopefully catch the eye of those non-Catholics who wrongly believe that the Reformation recreated the original Church by some magic. A careful look, especially at the Apostolic Fathers, reveals that the early Christians shared the same basic theology which has organically become modern Catholicism. This is why priests in their daily prayers (the Divine Office) have a daily dose of these ancient writers as part of their spiritual food.